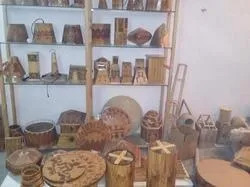 Banking upon our in depth knowledge, established in 2014, Juhi Artz, offers the best Wooden Lights and Lamps, as one of the reliable manufacturer, exporter & supplier. Our product range includes Wooden Lamps, Wooden Decorative lights, and Wooden Floor Lamp. The product range offered by us is applauded in the market for its elegant design, less maintenance and optimum performance. Moreover, we consistently improve our technology to bring new & effective Wooden Lights and Lamps in the market. Our products are admired in Middle East, Dubai, America and Netherlands as they suit every client's budget. Due to all these core strengths, we have been successful in establishing a foothold in the market. We pay enormous amount of attention in the manufacturing process of our products. Moreover, all the raw materials required are sourced from only certified vendors of the market. We make sure that our offered range goes through a stringent quality check process after it is manufactured. Our adept specialist, skilled designers and efficient labors aims at creating most elegant and admirable interiors, in strict accordance with the client brief. Products offered are in sync with the recent market trends and applauded by the client base. The establishments we develop are extensively appreciated by customers for their attractive looks, use of qualitative material and durable base. 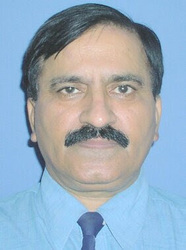 Under the umbrella of Mr. Jitender Kumar Verma; we are remarked as company specialized in Wooden Lights and Lamps. His firm commitment, expertise, conscientious efforts has enabled our company to create a niche in widespread marketplace and reliable name among customers. In order to have smooth execution of trade tasks, a modern infrastructure set up is built by us as per prevailing architectural layout. Our firm has maintained a designing cell, where blue-prints and plans are prepared for products and acoustic material for lamps. 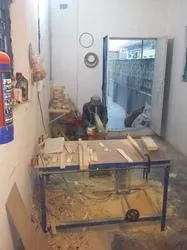 The manufacturing cell covers the major area, several hi-tech machines and tools are updated in it so that entire gamut can be produced in a good speed. Moreover, we have a spacious warehouse, where entire self made as well as imported stock is safely stored till dispatch. Due to the immense creativity and innovation of our adroit designers, our products and services have got high credibility. We provide products by keeping in consideration surroundings, corporate atmosphere and space. For our enterprise, key to success lies in offering high quality products to the respectable customers. We have a strict quality controlling team, which regulates & controls all the stages of production and post-production so that commendable products are offered to customers. These personnel stringently examine entire developed range in a quality checking cell on several parameters to ensure complete perfection, prior to dispatch. Our firm has maintained a modern quality checking division, where entire self made as well as imported range is gauged to ensure high quality. We examine our products on the basis of their finish, resistance to tear, design accuracy and looks. Juhi Artz ventures successfully for a major paradigm shift in contemporary use of pinewood in an innovative manner. Juhi Artz has conceptualised and created innovative designs using pinewood altogether differently for the first time in the world. In fact, it exhibits the innate beauty of pinewood reflected through its intriguing products with glitzy effect. It has truly emerged as a trend-setter for pinewood lighting fixtures. 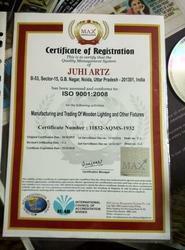 Juhi Artz is committed to its craftsmanship and quality products. For our company, key to success lies in gaining & enhancing the contentment level of honourable clients. From taking care of their specifications to charging economical rates, all our endeavours focus at winning trust of clients. Further, we keep ease of patrons in our mind and accept them payments via variety of modes, which suits them as per their convenience. Our patron oriented policies, promptness, specialised solutions and excellent track records have enabled us to stand a step ahead of our counterparts.